You might like this game if you like logic games. 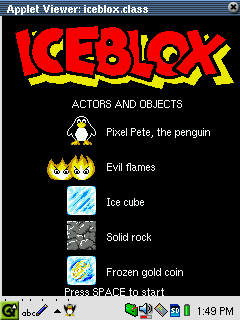 Iceblox is a simple logic game written in Java. A cute little penguin can be walked around a field of iceblocks. Some of them contain a gold coin which have to be collected. 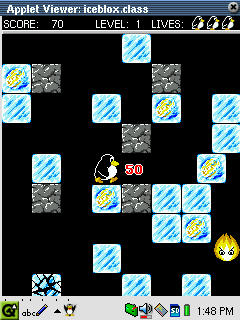 Unfortunately, some evil flame monster try to kill the penguin. They have to be avoided or iceblocks have to be moved on them which kills them. The level is won once all gold coins are collected. Iceblox is a simple yet nice little game. There are not many options but all the things implemented are done well. The game works nicely. The graphics is good yet not fantastic. It is fun to move the cute little penguin around and hunt done the gold coins. The game won't keep you playing forever but it is certainly nice to play in between a coffee break.